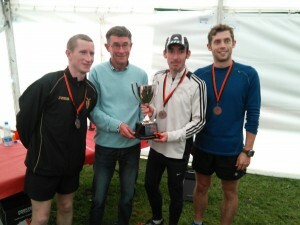 The big event of the weekend was the NI Athletics road relay championships ran by Orangegrove AC in Victoria park. With 3 teams out it was a clean sweep of medals with gold, silver and bronze. First up were the mixed team of Claire Prenter, Athanasia Sevastaki, Kent Swann and the up and coming Conor McQuillan. All 4 put in strong performances to finish with a silver medal pipping East Coast AC by 4 seconds with Conor running one of the fastest laps of the day in the process. it was a gold medal by over 30 seconds. The open team also had a medal winning performance taking a bronze after solid runs from Connor Magill, Brendan Grew, Mark McKinstry and Conal McCambridge – Conal holding off Joe McAllister to pip St Malachys by 2 seconds. Alan O’Hara ran the second fastest time of the day and Connor Magill wasn’t far behind with the 4th fastest time. First up for the juniors on Saturday were the Primary School children running in the 800 metre race. Kelvin Kearney was first over the line in 6th place followed by Bryanna Catney who finished second girl, a mere two seconds behind the winner. There were also good runs for Patrick McShane, Daire Brown, Aoife Gorman and Leah Finnegan. The U13’s were up next with Thomas Reid winning the race. Damian Marquess was next over the line to finish 5th boy followed by Mollie O’Hare who finished 4th girl. There were also good performances from Brendan McCambridge who finished 9th and Coirle Finnegan and Lorna Muldoon who finished 9th and 10th respectively. There were six Harriers running in the U15’s. Rioghnach Catney was first girl to finish in 6th Place, Katie O’Hare was not far behind in 9th and a great run also from Raoisle Hoy who finished 11th despite falling at the start. The McShane twins had a battle right to the line with Piaras edging out Sean finishing 15th and 16th respectively just ahead of Odhran Catney who finished in 18th position. Cathy McCourt continued her successful return from injury to take 2nd in the runher 10k at stormont finishing in 39:38. Amanda Perry also made the top 5 finishing in 4th place overall in 42:17, Nuala Muldoon made the top 20 in 51:08 and Michaela Murphy finished in 1:10 minutes. At the Slieve Gullion mountain race – the final mountain race of the season – Simon Reeve had his 2nd outing of the day and continued his good form in the mountains finishing in 7th place. In the Athlone “three quarters” Gerard McNamara and Jim Clinton made the journey in preparation for the upcoming Dublin marathon. Gerard finished in 2:28 for 102nd place and Jim finished in 2:43 taking 210th place. Over 700 took part. Michael Fitzpatrick made the journey to Drumragh making the top ten in 36:17 while Martin Cox continued his good form to finish just outside the top ten in 13th running 41:01. At Victoria park Simon Reeve had his first run of the day finishing 2nd in 18:37 while Drew Crawford also took part finishing in 26:47. At Falls parkrun stalwart Jim Clinton finished in 25:52. 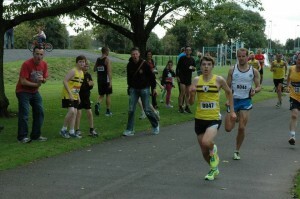 Martin Rea took 3rd at Ormeau in 18:08 with Philip Donnelly doing likewise at Queens in 19:56. 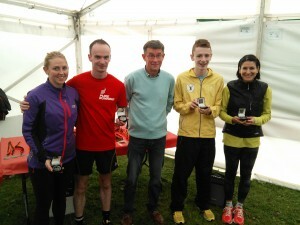 John Lavery also ran Queens finishing in 22:45 and Ciaran Hunter just missed out on his PB in 24:11. At wallace park Cathy had her first outing of the weekend finishing 2nd overall and first woman in 18:58. Over at the home turf of the waterworks the usual large contingent of harriers took part. Jim Benson took 1st place from Gerry Gribbon running 18:52 and 19:11 respectively. Ray Cameron made a new PB in 20:04 taking 9th just ahead of John Murphy who finished in 20:06 pipping the trio of harriers Matt Shields, Lance Breen and Greg McClure who finished in 20:13, 20:14 and 20:19. Paul Williams made the top 20 in 21:12. Juniors Eamon Sheridan and Andrew Milligan were next up in 21:51 and 22:09 respectively. Jack Carberry ran 22:46. 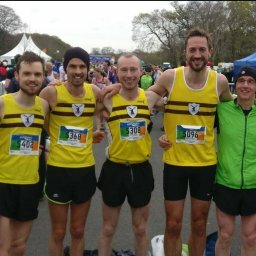 Conor O’Rawe ran a new 23:19, Nuala Muldoon ran 23:57, John O’Rawe closed in on the 100 mark in 23:59, Roisin Hughes ran 24:21, Mary Ringland 25:56, Aaron McCann 29:39, Tina Haggan 29:46, Thomas McKinstry 29:48 and Christine Douglas 46:25.